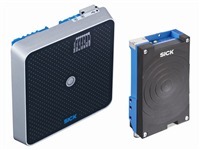 SICK, a manufacturer of automatic identification products for factory and logistics automation, has launched its RFU630 ultra-high frequency (UHF) RFID interrogator for enhanced industrial applications. The RFU630 is a fully integrated proximity interrogator for use with passive transponders in applications with scanning distances of up to 5 meters. Key applications include material handling in distribution centers (bin, tote, and tray tracking), warehousing and product storage, and direct on-metal mounting (automotive manufacturing). The RFU630 provides a common connectivity and programming platform for all three of SICK’s automatic identification technologies: RFID, 1D bar code and 2D image-based code-readers. On-board industrial communications protocols include: Ethernet TCP/IP, Ethernet/IP, and Profinet. RS-232, RS-422/485, and CANopen are also standard. Furthermore, this product allows connection to expansion modules, enabling integration with Profibus, DeviceNet, and EtherCAT networks. The integrated UHF read/write head includes a sophisticated controller, antenna, and communications protocols in an industrial IP 67 housing, also with an FCC approval and CE marking, among other country-specific certifications, which makes this device applicable around the globe.